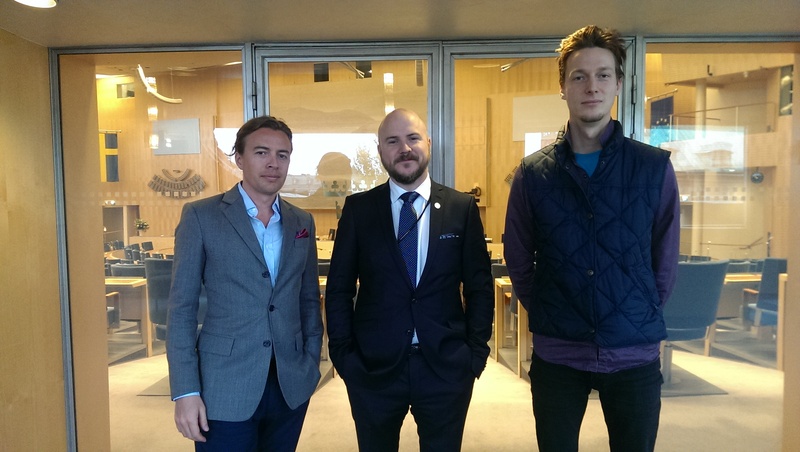 This morning BTCX was receieved at Riksdagen by newly elected MP Mathias Sundin of Folkpartiet (right wing liberal Peoples Party), also known around the world as the ”bitcoin politician” after having run his campaign on bitcoin donations only. CEO Christian Ander and Marketing manager Joakim Herlin-Ljunglöf sat down with MP Sundin for about an hour and spoke about how the financial evolution sparked by bitcoin can put Sweden in the forefront of progress. We also asked for the MP’s input and assistance concerning the trouble almost every bitcoin company are experiencing when dealing with traditional banks. At BTCX we want the legislators of Riksdagen to see the awesome possibilities of bitcoin and cryptocurrencies, therefore we will cooperate with the MP to put together a seminar on the subject. oktober 21, 2014 i Bitcoin, English, Politics. At Riksdagen (Swedish Parliament) again. This time with banks! We’re opening the first Swedish Bitcoin Embassy! And it was on TV!